What Does Real Food Look Like? 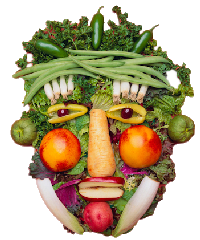 Thanks to decades of clever mass marketing campaigns, the average person has become completely disconnected with how our food is grown and also what real food should look like. With the agro-chemical companies chiming away that “there is going to be a food shortage if we don’t produce more food and decrease the world population in order for everyone to survive,” the reality is most people do not have a clue as to how their food is produced, where it is grown or how it is grown. Most people have no idea how their food is grown, much less who grows it! Processed foods, initially created with the intention to save time, are simply not a healthy choice. Some of these processed, ready to “heat and serve” products made with “real chicken” are breaded, seasoned and disguised in all sorts of geometrical shapes so that children will be encouraged to eat them. Meanwhile, the average child who primarily consumes this type of food has no idea what a chicken looks like, sounds like or the fact that chickens are smart, loving beings. People are so disconnected to food! Today, you can buy chicken that is boneless, skinless, know nothing about it other than that it is heat and serve. When I asked Joel Salatin about the growing he said, “As a culture, we essentially abdicated our responsibilities and kind of by faith we gave over this food responsibility to others over several couple of decades to where we are at the point now in our country where we have twice as many people incarcerated in prison as we have growing our food, which is again, a very aberrant civilizational statistic. It’s the first time it’s ever been done. It takes a true organic farmer to really get the point across about the benefits of growing organics and eating organics. Joel Salatin is an organic farmer from Virginia who talks about the problems he sees not only as an organic farmer but as a consumer of organic foods. In his best-selling book, Folks, This Ain’t Normal: A Farmer’s Advice for Happier Hens, Healthier People, and a Better World, he takes us into his world as he talks about how our food is produced and why we ought to take a closer look at where and how our food is produced. Click on the video below to listen to this segment of The Organic View Radio Show, as host, June Stoyer is joined by special guest Joel Salatin! Click this link to use our free podcast player to hear the interview! Food Labeling & Food Integrity: What Happened? Food labeling is very controversial for many reasons. While some people think it is the big corporations out to get us, the reality is, the laws are designed to benefit the large scale producers. How should consumers view labels and what should consumers do beyond labels? During the Great Depression, a flood of inferior food products threatened the integrity of the food supply. 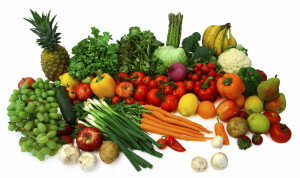 The 1938 Food, Drug, and Cosmetic Act set legal standards for most staple foods. In the year 2013, anywhere in the United States, it is still not mandatory to label products containing GMO’s on the label. Who are these laws protecting now? Have the laws intended to initially protect consumers changed to protect manufacturers? Salad Bouquet a weakened vinegar labeled “for use like vinegar”; Peanut Spred had few peanuts and much lard; and Bred-Spread had no strawberries, just pectin, dye, flavoring and hayseeds to simulate strawberry seeds. Joel Salatin continued the conversation by saying,”the whole labeling issue is monstrous. We’ve never claimed anything. We just say eggs, T-bone steak, ground beef, pork chops. We don’t claim anything. Now we have to put these nutritional labels on. Which of course would cost several hundreds of dollars per item. So we can’t afford, as a small farm, nutritional labels that are accurate to what we produce but the USDA says, that’s not a problem, you can use the generic label. So, we slap the generic label on, which is in many cases 300-even 500% off of our Riboflavin or folic acid or omega 3, omega 6 ratios. Do food labels really benefit consumers? When is a salad more than a salad? Our label on our food that we have to put on by law, is as wrong as night and day, doesn’t bear any semblance to the food that we produce but the labeling laws, in order to customize them so that they are actually accurate to our food would cost us thousands of dollars, which we don’t have and so the whole thing is just a joke. They (industry) are making it so that it is impossible to own and operate a small farm or what the big picture is, they are looking to wipe you (small farmers) out. This is business. This is the cost of operations. This is what is being forced upon a small business owner who owns and operates a farm. Period. You write about how people need to take responsibility. How can we reconnect ourselves and our families? Joel Salatin replied, “you cannot have people taking responsibility for the visceral parts of their lives without putting attention on that in the home. Homes used to be the centerpiece of everything that was important in life. Now home has become simply a pit stop between everything that’s important in life that happens outside. This is part of this crisis of participation that we don’t even participate in our family lives or our home lives anymore. All of our participation is outside. Eating together as a family, cooking together. In the book, I talk about all of the learning possibilities (a kitchen can almost become a chemistry lab). It can become a learning center. Then beyond that, take them out to a farm. People don’t bat an eye at Bambi and Thumper, Disney vacations, or Caribbean cruises or summer camps and that entails a lot of money and a lot of time. Take the year off from that, take that budget of time and money that you would have normally spent recreationally like that and go find your farm treasures, your food treasures in your community. What will happen then is that you will gradually build an informed platform from which you can make proper decisions. You will begin to learn (that’s good farming, that’s bad farming.) You will be able to smell (that’s good food, that’s bad food) You will be able to see (that’s good food, that’s bad food). As you develop that experiential immersion in food from farm all the way to table, obviously, with kids, more is caught than taught. If we see that something is important, kids usually think it is important too. Once they start tasting it and seeing the difference…then, they are ready for it. The children really are our future. Whether you are a parent, a responsible adult or just someone who wants to make a positive change, we have to set the example for the younger generations. “Once you are taught the knowledge, especially children that possess that knowledge they take that with them for the rest of their lives. It does make a significant impact and affects how they not only live their lives but also their food choices and how they carry themselves throughout their lives. If they have the respect for the land and if they have the respect for nature, that is going to really make a significant impact in their overall disposition throughout the rest of their lives,” said Joel Salatin. When people do pay attention it is usually when they have a either a personal health crisis or someone that they love has a health crisis. That is when the light bulb goes off and then they start paying attention to not only where is the food grown, how is the food is grown, but who is growing it and what methods are they using to grow it. According to Joel Salatin, “a healthy 50% of the visitors that come to our farm or take our seminars are conservative homeschoolers who opted out of the institutional education system, found it soul satisfying and said, well, good grief! What else am I missing? The whole idea to opt out of the mainstream thinking whether it’s investment, education, recreation, food, medical. What happens is there is one drip. Maybe, for some people it is that they bite the bullet and went to a chiropractor instead of, for example, a medical doctor. Then maybe the next thing you know they are going to a homeopath. Boy, what happens is when a person opts out of the conventional thinking and finds it beneficial, well, then they are screaming to find other things. Have you ever wondered about what preservatives do to our food? Anything that has a shelf life for several years is not as nature intended it to be. Joel Salatin explained, “when food gets processed,when you take the ingredients in DiGiornio’s frozen pizza for example, frozen microwavable pizza, that pizza becomes a totally different critter than the raw ingredients that went into it. That’s true for practically everything from chicken nuggets to whatever to cheerios. I remember reading well decades ago reading about Wheaties and that you could take wheaties and feed rats and the would die but if you took the raw ingredients that were listed on the label and feed rats, they were perfectly healthy. Velveeta Ingredients: Milk, water, milkfat, whey, milk protein concentrate, whey protein concentrate, sodium phosphate, contains less than 2% of salt, calcium phosphate, lactic acid, sorbic acid as a preservative, sodium alginate, sodium citrate, enzymes, apocarotenal (color), annatto (color), cheese culture. Want to read the book? Click the image below to order a copy of Folks, This Ain’t Normal: A Farmer’s Advice for Happier Hens, Healthier People, and a Better World! Sprouted grain flour is a staple in my kitchen. I make it from time to time, in bulk, and freeze it for use in sweet things like these sprouted grain cookies, or in this sprouted bread with milk and honey. Sprouting sweetens grains naturally, and the process also helps to mitigate the effects of antinutrients like phytic acid which are found in whole grains. It release a bit of the plant, one that’s imprisoned in the grain’s tough layer of bran. When the conditions are right – moist and slightly acidic – the little plant begins to emerge, if only slightly. It’s a beautiful transformation, the release of life from something so small and so seemingly inactive. All whole grains (and beans, seeds and nuts) promise an array of vitamins, minerals and dietary fiber which is why health authorities (rightly, or wrongly, you might think) emphasize them as a source of good health. And, despite all the emphasis on whole-grain this and whole-grain that, what they fail to emphasize is that these whole grains are also a source of antinutrients -substances that actually prevent you from fully absorbing the nutrients whole grains contain. Listen closely now: you might eat as many whole grains as you like, but without proper preparation to mitigate the effect of these antinutrients, you are not reaping the rewards you should. Grains want tender, long and thoughtful cooking. This means grains need to be treated first to release their full array of nutrients to your body. Soaking, sprouting and souring accomplish that goal which is also why I emphasize sourdough baking at Nourished Kitchen. Now, sprouting won’t remove all of the antinutrients in the grain – but it has some effect. To remove them all, you need to mill the grains and extract all the bran, but sprouting does accomplish quite a bit not only to release the existing minerals from the grain, but to improve its complement of vitamins and protein. Which grains can I sprout? You can sprout any grain, provided you’re working from the whole grain berry, not a rolled, flaked or otherwise damaged grain. Wheat, spelt, oats, barley and einkorn all work well for sprouting. Oats are a high-fat grain, and are often treated with steam or heat and dried prior to packing and distribution, so if you wish to sprout oats, take care to purchase untreated oat groats intended specifically for sprouting. In most cases you’ll be able to purchase whole grain berries at your local health food store in the bulk bins. 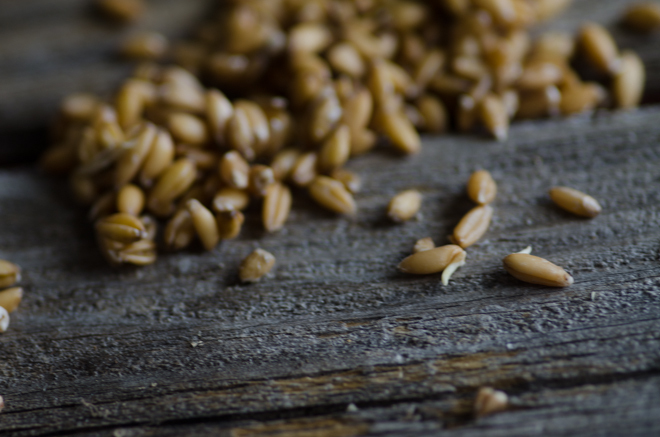 Common grains like spelt, wheat and rye are available at even the smallest stores; however, untreated oats for sprouting and einkorn berries are less commonly available. 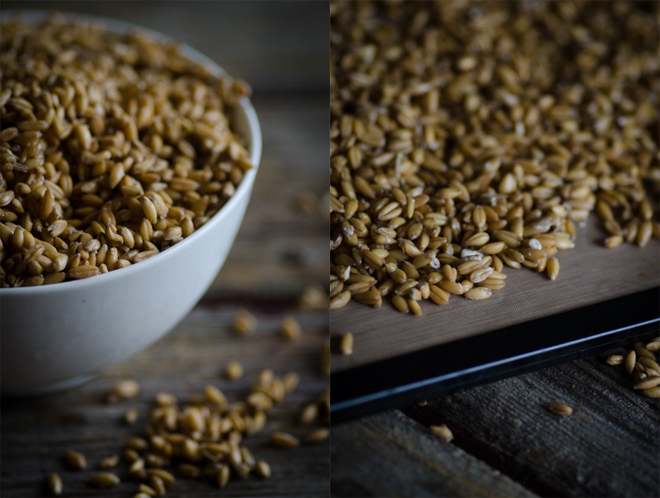 For my family, I purchase both einkorn berries and sprouting oats online. Common Grains (Spelt, Rye, Wheat, Rice): Check your local health food store’s bulk bins, or inquire at your buying club. Untreated Sprouting Oats: Are not widely available yet, as most oats on the market have been heat-treated due to the volatile nature of their oils. I purchase organic sprouting oats online here. When sprouting grains to make sprouted grain flour, you must be mindful of the time it takes to sprout while not allowing your sprouts to grow too large. Certainly, once that little speck of a root appears at the end of the grain, it’s tempting to let it continue growing. Yet, by allowing the sprout to continue to grow, you run the risk of malting the grains. Malt, in small amounts, adds great depth of flavor to baked goods; however, when used exclusively or in large amounts it will produce an overly sweet, gooey bread that never cooks through. In using sprouted grains for flour, be mindful to begin dehydrating the grains shortly after the root tip appears. Sprouted grains should also be dried at a relatively low temperature in a dehydrator; just as allowing the sprout to grow too long can fundamentally change the way the flour performs, so too can drying it at a high temperature. An oven doesn’t work well as a substitute for a dehydrator in this instance. I live in a very small, modest home with a surprisingly tiny, equally modest kitchen – about 40 square feet. I do not like to clutter what little space I enjoy with too many appliances and kitchen gadgets; however, there’s a few items I find to be absolute necessities for sprouted flour making. Fortunately, they all serve multiple purposes. Dehydrator: To prevent sprouted grains from roasting in the oven at too high a temperature, I dry them in a food dehydrator. I have a 9-tray dehydrator that I also use to preserve the summer and autumn harvest, to help bread rise and to keep a constant temperature for yogurt making. I also make sure to use Paraflexx sheets which keep the grains from slipping through the holes in the dehydrator’s trays. Grain Grinder: When I first began grinding my own grains for flour, I used a Nutrimill; however, early this year it stopped working, and I purchased a Komo Grain Grinder and Grain Flaker which is blessedly quiet and doesn’t heat the flour during grinding. There are many grain grinders, electric and manual, in a variety of price ranges. You can check out this resource to determine which meets your needs the best. If you haven’t the interest or time to sprout your own grains for sprouted grain flour, you can also purchase sprouted grain flour online (you can find it here), as well as in some large health food stores. For many people who have neither the time, space or desire to make their own sprouted grains and flours, purchasing organic sprouted flour is often the best option. Pour the grains into a large mixing bowl, and cover with warm water by 2 inches. Stir in the vinegar, cover the bowl, and set it on the counter. Let the grains soak, undisturbed, for 18 to 24 hours, then drain the grains and rinse them well. Pour the grains into an over-the-sink fine-mesh sieve (like this one), and rinse them under flowing water. Stir the grains with your hands. Twice a day for 2 to 3 days, continue rinsing and stirring the grains, a tiny, cream-colored sprout emerges at the end of the grains. Transfer the grains to dehydrator trays lined with a non-stick sheets (find them here). Dehydrate the grains for 12 to 18 hours. Once the grains are firm and dry, transfer them to the freezer or grind them in a grain grinder (find them here). Grind them to a fine flour, sift it, as desired, and store it in the freezer until ready to use.